Frans de Waal tries to convince us that we're all apes and that there's little difference between us except that we walk on two legs. At first you think he’s joking. Perhaps not. A global ethologist and zoologist, de Waal is best known for his work on the social intelligence of primates. He thinks that if we ignore the importance of power struggles in the study of human nature, we're making a big mistake. 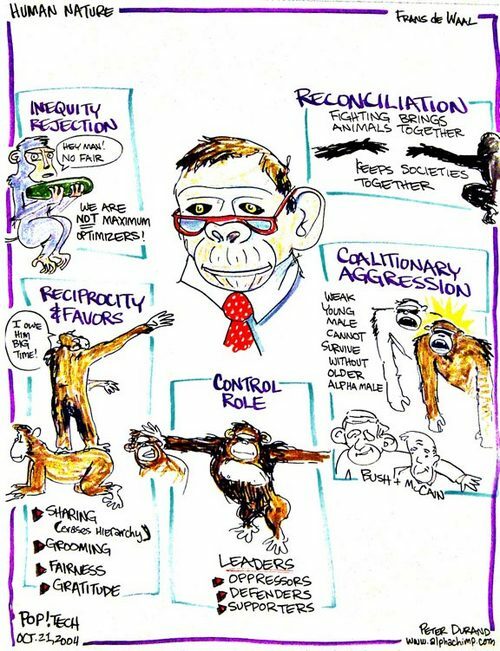 In his talk, he draws constant parallels between primate and human behavior and uses politicians as examples, including visuals of where aggression can also be used for reconciliation and how it plays a positive role, not just in politics, but in business and our social lives. Listen to presentation.